Comments: Evergreen broadleaf native to southern Asia and Europe. This plant has shiny dark-green oval leaves with short holly-like spikes, dark purple inedible fruit with a large seed, and gray bark on the trunk and major branches. 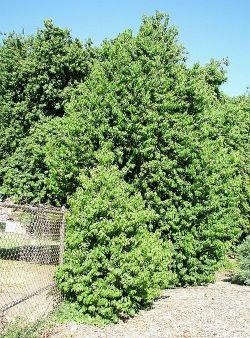 The tree is often used as a hedge or screen as the foliage is low growing and very dense. Mature trees to 40' or more. Leaves, stems, fruit, seeds, and bark are poisonous.